Hundreds march against NATO | Fight Back! 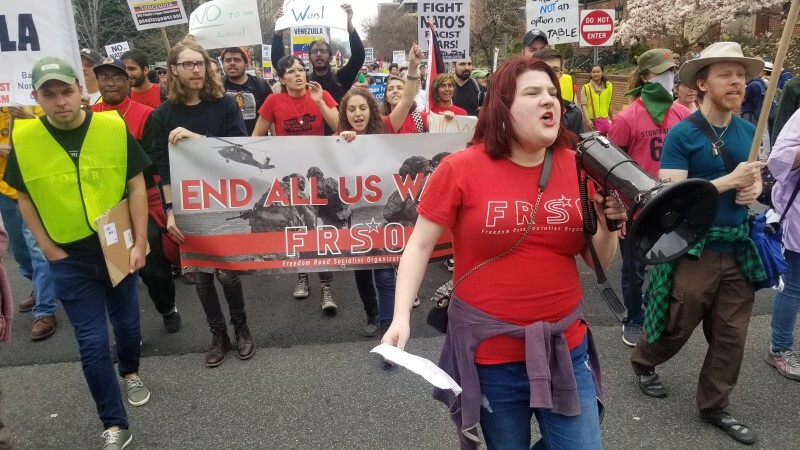 Washington DC – Hundreds of people gathered in Lafayette Square, a park opposite the White House, March 30, to respond to the call to action against NATO, racism and war. The organizers also strongly emphasized the slogan “Hands off Venezuela” to protest the Trump administration and NATO’s attempts to overthrow the democratically-elected government of Nicolás Maduro. The speakers each masterfully highlighted the importance of opposing NATO and U.S. intervention from the lens of the struggle their group was taking on. Groups represented movements from labor, national liberation, queer rights, student activism and more. The march took the hundreds that gathered in the park and set them into the streets of D.C. The protesters loudly chanted as they passed onlookers. The route had the protesters stop by different prominent buildings that were connected to NATO, imperialism, and other symbols of oppression. Once they got back to the starting location, there were a few more speeches to close a militant and successful day.